Barbara A. Trautlein, Ph.D. argues that just as we can measure our IQ, our EQ, and any number of our other intelligences, we can also assess our change intelligence. Barbara developed Change intelligence model, or CQ, as a tool to provide leaders awareness of their own change leadership style and the ability to adapt their style to be optimally effective in leading change across a variety of situations. I asked Barbara how we can use the CQ model to diagnose our change intelligence and how it can help us leverage our personal change leadership style to lead change more effectively than before. Barbara is principal and founder of Change Catalysts, the author of the book Change Intelligence: Use the Power of CQ to Lead Change that Sticks and the originator of the CQ®/Change Intelligence® System. She has over twenty years’ experience empowering people to achieve transformational professional and personal goals. I had the opportunity to attended Barbara’s presentations at the 2013 PMI Global Congress in New Orleans. Her presentation was outstanding. She even received a standing ovation from the audience, something that I have not seen happen ever since I started going to this event in 2006. I highly recommend Barbra as a keynote speaker. Tell us little bit about your background and the work that you and your team do at Change Catalysts? How did the idea for CQ come about and what motivated you to develop the model? Can you give us an overview of the model? Can you speak to the other aspects that make the model different from other types of change models? What do we know about the neuroscience of change? Can you talk a little bit about how your clients implement the model in their organizations and can you touch on what type of changes the model is well suited for and type of results your clients experienced from implementing the model? 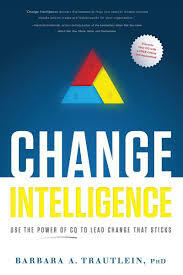 Tell our audience about your book: Change Intelligence: Use the Power of CQ to Lead Change that Sticks and how your firm “Change Catalysts” can help their organizations with their change initiatives? More about Barbara A. Trautlein, Ph.D.
During her career, Barbara has conducted workshops for thousands of participants, coached many dozens of people from CEOs to union workers, and facilitated over a dozen mission-critical multi-year change management initiatives—achieving bottom-line business and powerful personal results for clients. She is gifted at sharing strategies and tactics that are accessible, actionable, and immediately applicable. In addition to her “hands on” work with clients, Barabara is a recognized expert, author and researcher on leadership and change management best practices. It is this blend of research and real-world expertise that has made her an in-demand speaker and presenter at conferences in North America, South America, Asia, and Africa. Barbara holds a Ph.D. in Organizational Psychology from the University of Michigan.